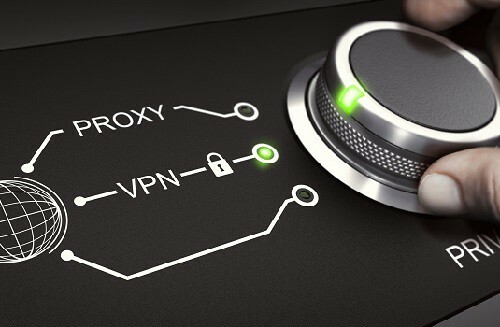 VPN vs Proxy: which service meets your needs? Yet being two different services, VPNs and proxies have many things in common. They both aim to protect the identity of users and provide anonymity. They can hide your online identity and your geo-location and let you surf anonymously. However these two tools aren’t actually the same. First things first. Let’s have a look at what a proxy is, and how it is different from a Virtual Private Network. Since many users might even confuse these two different services. How does a proxy service work? A proxy (in particular a web proxy) is a server, i.e. either a computer system or a program in computer networks. It acts as a “middleman” between a sender and a recipient – a web client and a web server. The proxy handles the requests from the client by fetching the looked for resources from a remotely located server and delivering them back to the client. This is how the indirect internet connections between a user and the internet itself are created. The proxy service routes your traffic through its remote server, so it appears like the traffic is coming from that server IP address, and not from your computer. Basically, you can visit a website and get the required information, whereas this website doesn’t get your information. The proxy can help you to stay anonymous during the internet surfing. Requests for the required information come from the proxy server, so not directly from you. That’s why you will be really hard to track. Anonymity is what you can expect. It might help to speed up your browsing. Proxy servers can cache resources. Once you send a request to a proxy server, and it appears that this resource you are looking for is cached on its local hard disk drive, then it won’t take much time to send it back to you. It can help you to bypass access restrictions to blocked content. Also it can block the undesired websites. And it can help to prevent data leak by scanning the outbound resources. Virtual Private Networks also make it appear like the internet traffic is coming from another location, so your real IP address is hidden. However, unlike proxies, VPNs not only make it possible for you to be anonymous, but also they guarantee the protection – an online security. Thanks to security protocols, your data gets encrypted, i.e. no one except you can access it. This is a huge advantage of a VPN. You can expect an encryption, for instance, up to 256-bit keys or even higher. You can rest assured that the traffic exchanged online and your personal info are protected. And it means a lot when it comes to cyber security, especially taking into consideration recent events when we once again faced that ISPs snoop into our online activities. And now it’s even “legal”. VPNs also have all the above-mentioned benefits of proxies, however, much better and more enhanced. With VPNs you are protected against any third party including your ISP. And with proxies, data transferred can easily be intercepted by prying eyes. On the other hand, not strong enough VPN services can compromise your internet speed because it requires some processing time to encrypt and then decrypt the data. So the security provided consumes some speeds. With reliable VPN providers you don’t have to worry about it since they offer great features that can even boost up the speed. And proxies can also slow down the speed because their servers can get really overloaded. Data leakage with VPN? No way! How to check it?